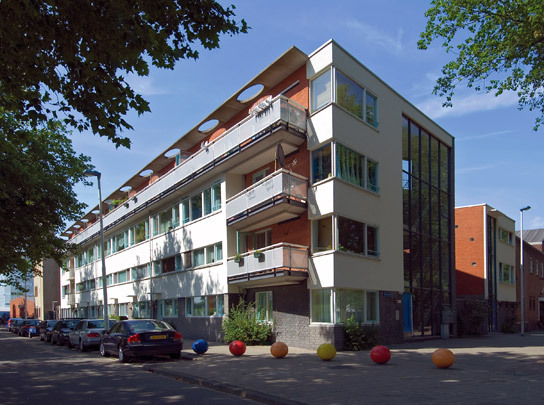 The acronym 'Botugat' stands for building in gaps left in the Bospolder-Tussendijken area. Seven such gaps scattered across this urban renewal district have been filled with a standardized dwelling type modified to suit each site. The blocks of maisonettes slip into the existing lot division partly by having internal galleries and balconies. With its brick basement rendered in pastel hues, this is the prototype of Mecanoo's well-groomed neo-modernist architecture and an object lesson in successful urban renewal: decent, affordable dwellings of a high architectural quality.